During the winter there is nothing more comforting than sitting down to a nice, hot bowl of nourishing food. 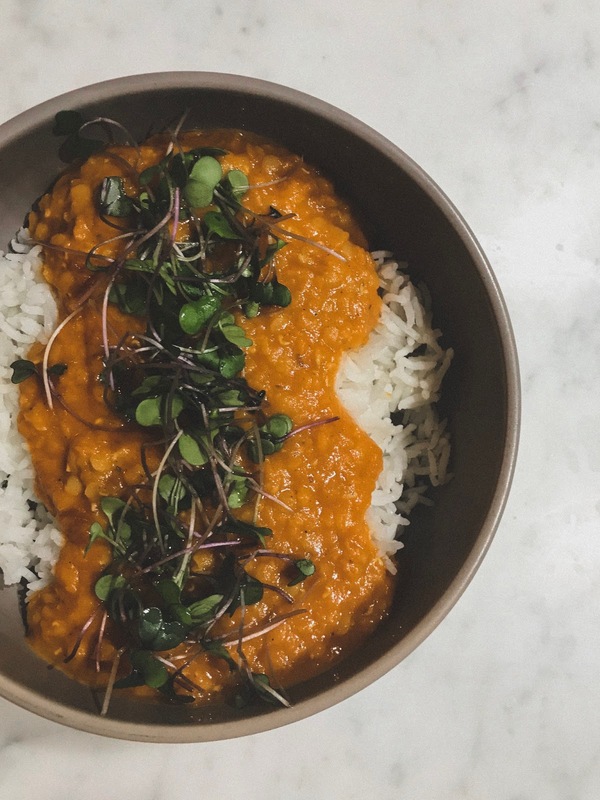 Soup is great, but sometimes I crave something heartier and more filling, this is where my favorite dal recipe comes in! This is an adaptation of an 101 Cookbooks Coconut Red Lentil Soup recipe, that I have tweaked a bit and made my own. It's definitely one of my most frequently made winter dishes, is super simple and tastes great even after only a quick 30 minutes on the stove. I love to serve it over basmati rice, topped with sprouts, and (if I'm feeling extra indulgent) with a piece of naan. Rinse lentils well (until water runs clear) and place in a large dutch oven with both quarts of stock, bring to boil. Reduce to simmer, add 1 tablespoon of the grated ginger, and the diced carrot - allow to simmer for about 20 minutes. In a separate, dry saucepan, add curry powder over medium/low heat and toast for a few minutes, tossing every so often to prevent burning. Set aside. To the saucepan, add coconut oil over medium heat. When the oil has melted, add the 2 remaining tablespoons of grated ginger, the sliced green onions, and the golden raisins - sauteed for a few minute, until softened. Add the curry powder and tomato paste. Sautee for a few more minutes while constantly stirring - we don't want the sauce to burn, just to cook off the 'canned tomato' flavor. Add the tomato sauce, can of coconut milk and salt to the lentils (they should be quite thick at this point). Stir everything well to combine and simmer for about 10 more minutes, to allow the flavors to incorporate. Remove from heat, and cool for a few minutes before serving!